POLIAKOFF, Mendel (Mendy) L., died November 5, 1999, after a brief illness. Born September 25, 1945 in London, England, Mendy was raised in Tucson, where he was a member of Tucson Boys Chorus in his youth. He attended Tucson High School and the University of Arizona. He owned and operated the College Bootery for 15 years. 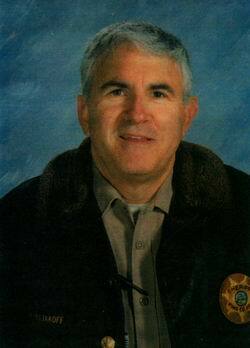 Changing careers, Mendy joined the Pima County Sheriff's Department, where he taught the DARE program. He was admired and respected by students, teachers and administrators. He was past president of the Men's Club at Temple Emanuel. He later revitalized and was president of the Men's Club at Congregation Anshei Israel. He was a member of Knights of Pythias. Survivors include his devoted wife Jane; children, Becky and Andrew Poliakoff, Liza and Benjamin Vickers; brother, Dr. Raymond (Kim) Poliakoff; sister, Gaylee (Dr. Steve) Rogers; and numerous nieces and nephews. Services will be at Evergreen Mortuary on November 7, 1999 at 12:00 p.m.
Burial will be at the Anshei Isreal section of Evergreen Cemetery. Rabbis Arthur Oleisky, Robert Eisen, and Cantor Ivor Lichterman will officiate. In lieu of flowers, contributions may be made to the United Synagogue Youth Scholarship Fund c/o Congregation Anshei Israel, 5550 E. 5th St., Tucson, AZ 85711 or to the DARE Program c/o Pima County Sheriff's Department. Just a few days ago, I lost a wonderful friend that I have know for almost 50 years. I don't know the reason he was taken from us and I doubt that I ever will. But the Lord took Mendy Poliakoff from us, much too early. Mendy was very active in Tucson's Jewish community and the community at large, as well. He was very active in Congregation Anshei Israel up until he time he became ill. The Poliakoff Family and I grew together from the early 1950's and still flourish. Both families lived across the street from each other in the area of 6th and Country Club and Mendy, Ray and Gaylee and I were always together. Mendy was a very quiet, but a very determined person and several stories come immediately to mind: *When Mendy had the afternoon newspaper route, I used to follow him on my bicycle watching him throw the papers. He tossed one subscriber's paper and the breeze carried it onto the roof. Mendy wasn't phased. He took out another paper and gave it the same deliberate throw and this too, landed on the roof, right above the front door. He then got off his bike walked up to the front door and dropped the paper on the front door step. And there was the time that Mendy, Ray and I were tearing through our neighborhood on our bikes and Mendy dropped from sight. Ray and I got home and Mendy failed to show. We retraced our steps and found Mendy laying on a sidewalk with his bicycle on top. He had broken his leg from cutting a corner too fast trying to keep up. But I'll never forget all the baseball and kickball that we played on the Poliakoff's front yard. The sprinkler was first base, the driveway was second and the small depression near the front door was third. Home plate was wherever you wanted it to be, in front of the bushes. Many a ball went into street and I will always remember the day when Mendy stepped up to bat, squarely hit the ball and it sailed up, across the street, and right through the neighbor's front window. We didn't know what to do!! Mendy and his family always worked exceptionally hard at the family business, Polly's Shoe Store which became the College Bootery. But Mendy's first love, as long as I can remember, was law enforcement. And after several years on the Pima County Sheriff Reserves, Mendy became a sworn deputy. For most of his law enforcement career, Mendy was the DARE deputy for several schools, his 50th birthday cake proudly read: "DARE to be 50." He quickly became an icon to the students and teachers he interacted with. This became so very evident from the get-well cards and letters he recently received. Mendy was rather quiet, not much of a talker, but his actions far outweighed that. He was a sweet, caring, wonderful man. I, his family and the community have lost a dear, dear person. I will miss him so.